THE ITALIAN MADE EXCELSIOR E 2 SEMI ROTARY HAND WING PUMP, A PREMIUM QUALITY REPLACEMENT FOR THE SIGMA K2. ALSO CHECK OUT THE OASIS WP2P AS AN ALTERNATIVE. "For numerous industrial, marine and domestic applications, an EXCELSIOR hand pump is a great solution." "Proven Technology" Used extensively in Europe today. The ultimate hand operated water pump for areas without electricity. The handle moves back and forth in a 90 degree arc, which in turn causes the wing with valve set (30) to semi-rotate within the body. 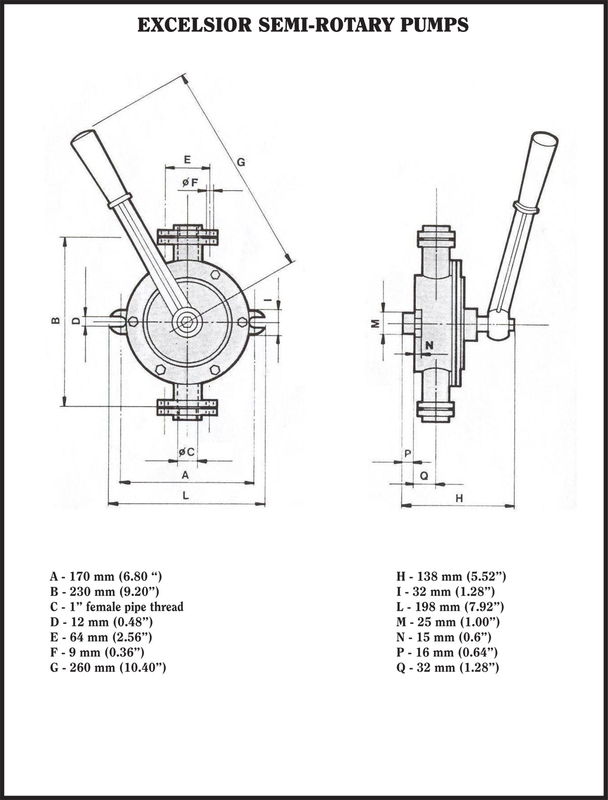 The vee valve (31) operates as the inlet check valve. The unit discharges fluid on both strokes of the handle. It must be bolted to a strong vertical surface with the inlet at the bottom or to either side - two mounting lugs are provided. The handle can be installed either pointing up, down, left or right. 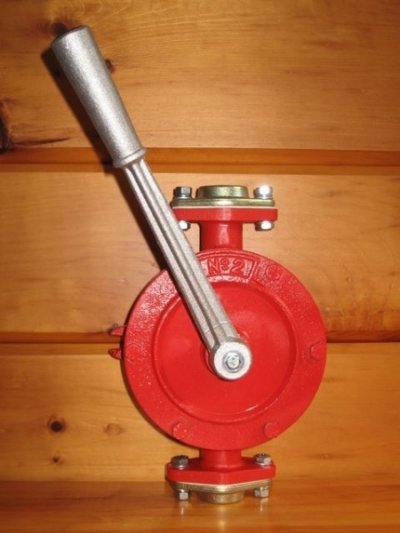 This pump incorporates many original technical features which make it the best of its type. Strong inlet flange, outlet flange and mounting lugs prevent breakage even when subjected to rough treatment. The tapered internal body is a unique design which assures automatic settlement of the wings, thus guaranteeing smooth efficient operation for many years. Each pump is tested to a suction lift of 7 meters of water and 20 meters of discharge head. CAUTION: Pumps used for water must be protected from internal rust whenever they will be unused for extended periods of time. Mineral oil (U.S.P. heavy - sold in pharmacies) is non toxic and can be poured in the discharge port for this purpose. Maximum Discharge Pressure: 37.5 P.S.I. Suction lift is the vertical distance from the pump to the surface of the water. 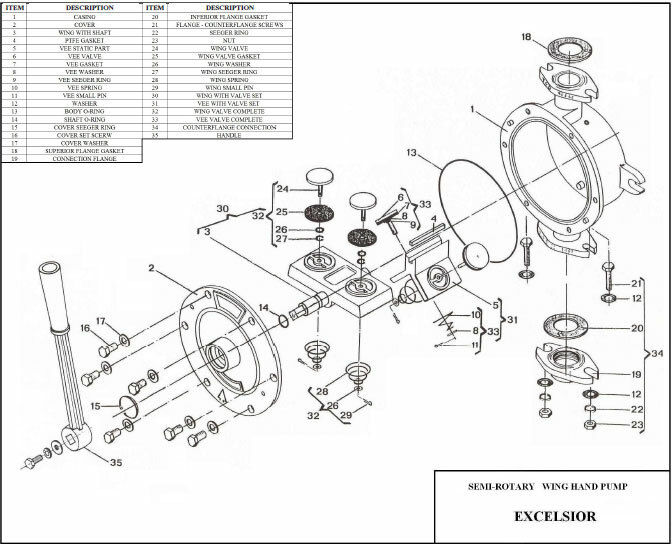 Excelsior E series pumps meet all major European industrial standards and have numerous industrial applications.